On the afternoon of June 1, 2013, forty one cadets from #42 Wetaskiwin Air Cadets held their year end parade, Annual Inspection. They did all of their fall in sequences in preparation for the arrival of the Reviewing Officer, Major J.A.D. Perry, CD. Major Perry arrived at the dias and was greeted with appropriate command, General Salute- Salute and the cadets executed it flawlessly. Our national anthem followed the salute and WO2 Brad Weers marched up to the Major and asked if he would like to do the inspection. Accompanied by representatives of the Wetaskiwin and Millet legions, City of Wetaskiwn, and the Wetaskiwin RCMP the inspection went off without a hitch. The cadets then did a March Past so that the Major would be able to see their drill and deportment. Again the cadets did not disappoint as they performed beautifully. Following the March Past there were awards for attendance of 80% or better, Marksmanship and Fitness badges. The cadets concluded the parade with an Advance in Review Order and #42 Wetaskwin’s march off sequence. A Mess Dinner followed the Inspection with all of the major awards for the year being handed out. Cadets were recognized for their drill, leadership, marksmanship and survival skills to name a few. 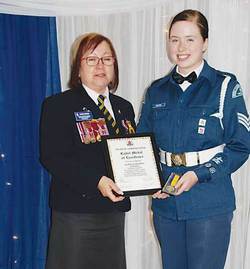 Two cadet medals were awarded; The Lord Strathcona to WO2 Brad Weers and the Royal Canadian Legion Cadet Medal of Excellence to Sgt Mahala Wichers. The last award of the evening went to Captain Barbara Furuness who was presented by Major Perry with the first bar to her Canadian Forces Decoration. This signifies that she has a minimum of 22 years service in the Canadian Armed Forces. This was the final parade for the year and the squadron will start back up in September. Twenty One cadets from the squadron will be going to summer camps this year and will be spending from 2 to 6 weeks away from home learning how to be better citizens of Canada and to help improve their squadron. Cadets is open to all young people between the ages of 12 and 18. If you are interested please come down to the Parade of Programs in the fall or on the first Thursday of September for our orientation night.